It's difficult to feel safe while venturing outside at night or in suspicious areas. While it's a troubling reality in many urban areas, college campuses are also vastly susceptible to public threats, where evening classes and late-night study sessions are unavoidable, and crime rates seem disproportionately high. In the case of a violent incident or safety hazard, there is typically little to do after dialing 9-1-1. In most circumstances, others aren't even informed of these incidents until after they have occurred, leaving many local community members vulnerable and unaware to the dangers that prowl in their midst. Wildfire is a mobile app that delivers real-time notifications to the user when an emergency situation occurs nearby. This service gives users the ability to inform others and send messages to emergency contacts and local community members if they witness a crime or safety-related incident. The concept of the app originated after Hriday Kemburu, Wildfire founder and CEO, experienced a close brush with danger while walking home alone at night. Two individuals in ski masks emerged from the bushes in an attempted mugging attack, but Kemburu managed to flee the scene safely, and immediately notified campus police. Subsequently, he posted about the incident in a student group on Facebook. Hundreds of students viewed the post, and many whom Kemburu had never met thanked him for the prompt warning. Despite all this, Kemburu realized that his reach was limited, and many other students wouldn't receive the warning in time. Ultimately, he decided that Facebook's restricted networks weren't enough to alert others and prevent similar incidents from occurring. "When an emergency situation happens near you, how do you hear about it? Many times people go hours, days, or don't even hear about incidents that have occurred nearby," Kemburu explains. 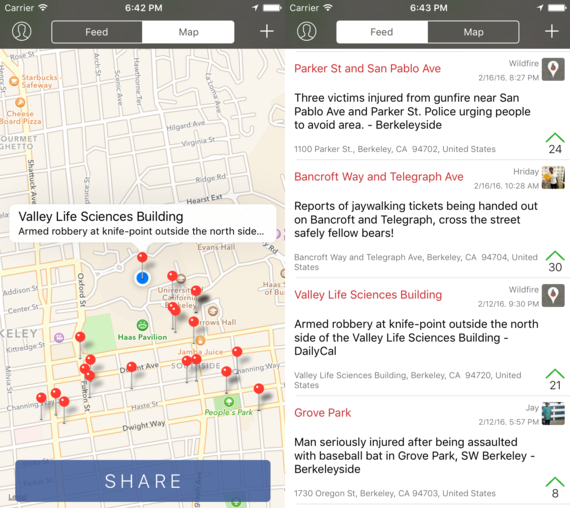 "Whether it's a mugging, a fire, or a shooting nearby, there aren't any effective ways of notifying your local community, friends and family, and local police in real time." Wildfire was created to remedy this problem. The simple function and sleek interface of the app make it easy for all audiences to use. The Facebook login feature ensures credibility, and allows users to view mutual friends of those who post on the app. Once logged in, the user receives a list of incidents that have occurred nearby, with the option to view as a scroll-down feed or as pins in map view. 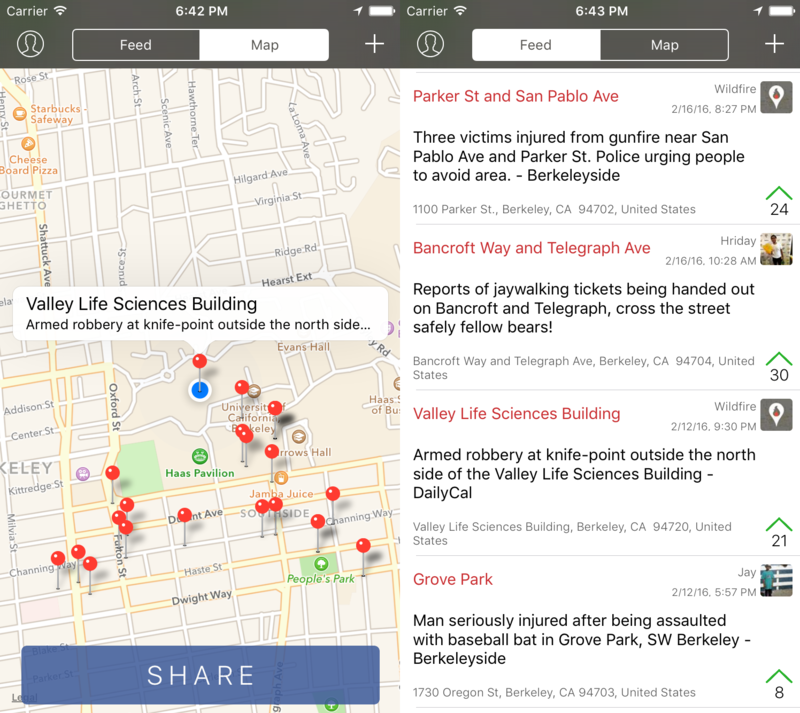 The app relies on crowd-sourcing from users around the community, as well as local newspapers and police. After witnessing a dangerous event or an unsafe environment, a user can post an alert, which is immediately displayed on the shared feed. Depending on the severity of the incident, the alert can even be pushed out to other users. Notably, Wildfire has some pretty helpful features. Users will be notified immediately if an alert is posted on the app, regardless of whether the app is in use. Furthermore, if a user has designated any emergency contacts, then those contacts will be notified regardless of whether they have already downloaded the Wildfire app, and will be notified via SMS, instead. 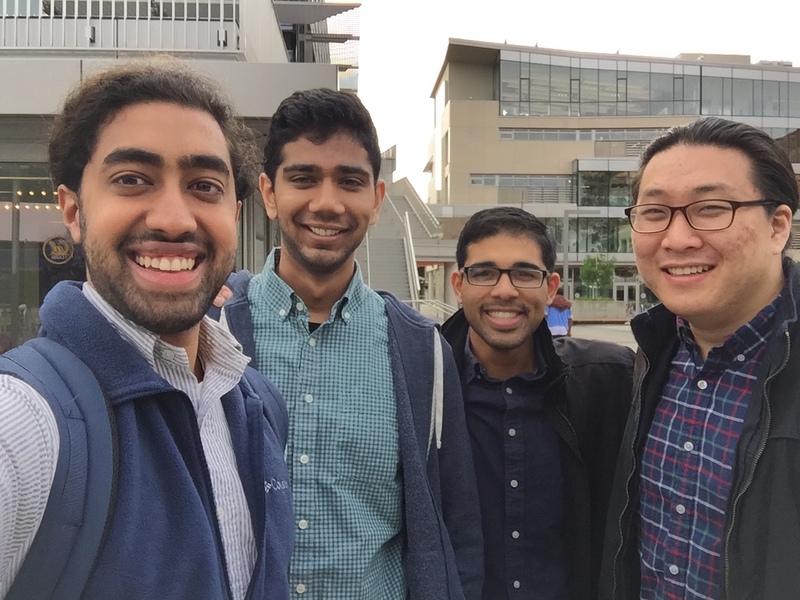 The team consists of four seniors at UC Berkeley. Jay Patel and Tim Hyon are tasked with mobile development as Technology Leads, while Vinay Ramesh serves as the group's Business Lead. The team of friends founded Wildfire in October, 2015. While the app is currently functional in and around the city of Berkeley, California, the team expects to launch Wildfire at other campuses within the year. "Our goal is to be the go-to safety app," Kemburu says. "Whether it's your home, workplace, or a place you're just visiting, you can use Wildfire to be informed about any incidents happening around you." The Wildfire app is free to use, as the team has chosen against a revenue model that would impede users from receiving the app's service. Instead, they're seeking ways to monetize Wildfire's service that do not limit the app's functionality, or its ability to keep users safe. The team is currently seeking funding to expand the development of their innovative mobile service. Download Wildfire for iOS or Android today to start sending smoke signals and protect your community.